The Kremlin plans to ram another business reform bill through parliament ahead of an imminent power change. Russia's President Dmitry Medvedev took further steps on Monday to improve the country's business climate as he strives to leave a legacy of lasting change and protect his business-friendly policies. Medvedev said he had submitted amendments to the Civil Code to the country's Parliament, in a move analysts say was long overdue. The president said the amendments should "help to strengthen the foundations of our economic life and improve our country’s investment climate." "It [the draft law] concerns practically every aspect of property relations in our country," Medvedev told an ad-hoc meeting of his senior administration officials at his Gorky residence outside Moscow. The policy thrust of the Kremlin’s draft bill is to improve good governance practices and transparency of legal entities operating in the country. Through a raft of amendments to the Civil Code, the Kremlin has tried to streamline and simplify procedures for registration of legal entities and to set new rules for economic activities, such as bankruptcy and mortgage lending, Justice Minister Alexander Konovalov told reporters in the Kremlin on Monday. Some familiar forms of legal structure, such as additional liability companies and closed joint-stock companies, will cease to exist in Russia, Konovalov said. "The novelty of this draft law is that it systematizes the organization of legal entities, and first of all, that of commercial organizations and NGOs." Konovalov said legal entities in Russia will henceforth be delineated into public companies and private companies, while every legal entity will be expected to prepare its financial statements and shares-issue in line with the new regulation. Certain business-friendly provisions in the draft bill, the Kremlin hopes, may also persuade Russian companies not to register their businesses abroad. "It's common knowledge that big Russian businesses are increasingly moving to foreign jurisdictions these days," Konovalov said. "We must create adequate legislation and its enforcement in our country that would prevent businesses from going abroad to sue each other or resolve conflicts, but enable them to do this in our country." Many Russian businesses, which operate solely or primarily in Russia, are owned by holding companies registered abroad, meaning that the company can use foreign jurisdictions in case of legal disputes, the Associated Press reported on Monday. Russian business people often prefer European law and courts for their legal battles because the Russian legal system is seen as arbitrary and laws are outdated and vague, the agency said. Opinion: Can an investment climate be improved from the top down? 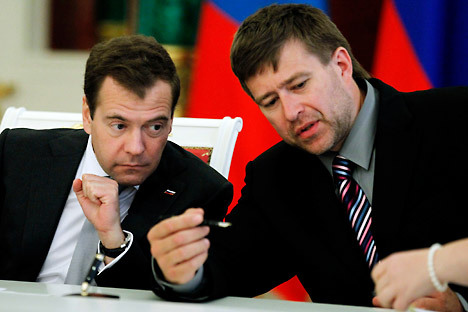 President Medvedev ordered the Justice Ministry to prepare amendments to the bill in November, saying that they had to be ready by February 1, 2012. During a February 2 meeting in the Kremlin, Konovalov assured the president that the passage of the amendments will ensure that the "interests of investors and creditors will be protected in Russia in a substantially more reliable, modern and more correct way than they are now." He added that the amendments "offer new judicial and legal opportunities for the benefit of those who are investing and are engaged in business in Russia." "A considerable amount of effort has been invested to ensure that contractual rights and liabilities, property transactions, deals and contracts – that is, everything that constitutes economic relationships in Russia today – are legally guaranteed," Konovalov said. However, the draft law still includes some controversial provisions, including requirements for offshore companies operating in Russia to disclose their beneficiaries. Konovalov said the provision was necessary to increase the transparency of the Russian economy and to prevent tax evasion. In order to fight sham companies, the minimum share capital for limited liability companies has been increased to 300,000 rubles, or $10,000, and up to one million rubles, or $33,000, will now be required to form a joint stock company. First published in Russia Profile.